Engineers are developing drones that will be capable of catching other drones. Drones have proved to be very useful tool in this modern era. Their useful impact in the field of security, surveillance, media coverage, war zones, fire zones and weather conditions has brought a revolution in the way how things work. Everyday engineers are working on new ideas to use drones for constructive purpose instead of destruction and war. Rising interest in drones is bringing new ideas to reality. 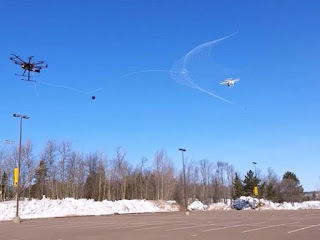 No denying to the awesomeness of drone technology but what happens when drones are in wrong hands? Engineers are now working on this idea to design and manufacture a drone for security agencies of the world which will be designed to forcefully take off any flying machines that pose a threat to high security buildings like military bases, airports, government buildings or sporting events. 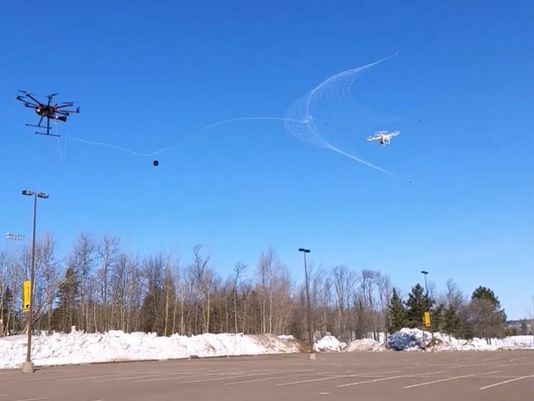 Net being used to catch drones. The system installed inside this anti drone device will use modern techniques to reverse engineer the system of a drone under observation. It will take just few minutes to take full control of the drone. There will be another function if the drone could not hack into system of another drone. This anti drone device will shoot a net on other drone to catch it and fly it to a safe place. UAVs are remote-controlled, pilot-less aircraft. They are designed to look like jets, airplanes and missiles or spiders with several helicopter-like rotor blades. Drones can be small enough to fit in the palm of your hand or as long as a 43-foot yacht. The machines can cost from as little as $30 for toys to as much as hundreds of thousands for professional-grade versions. Use of private drones is a big threat to security agencies all over the world. Although it is identifiable, but sometimes it is not easy to find who is flying a drone in a crowd. It can be used for spying by any terrorist organization. Government security agencies are working on devising systems to control such unmanned devices. So far only way to stop or catch a drone is to identify the man who is flying it. This is not safe at all. I spoke to a law enforcement agency’s representative in California this week and she informed that Government is planning to construct specialized control rooms in all major cities which will act as anti drone control rooms. Any drones or unmanned flying machines that will pose security threats will be controlled through this high tech infrastructure and brought to the security agency for further investigation. Licenses will also be issued for registration of flying machines.